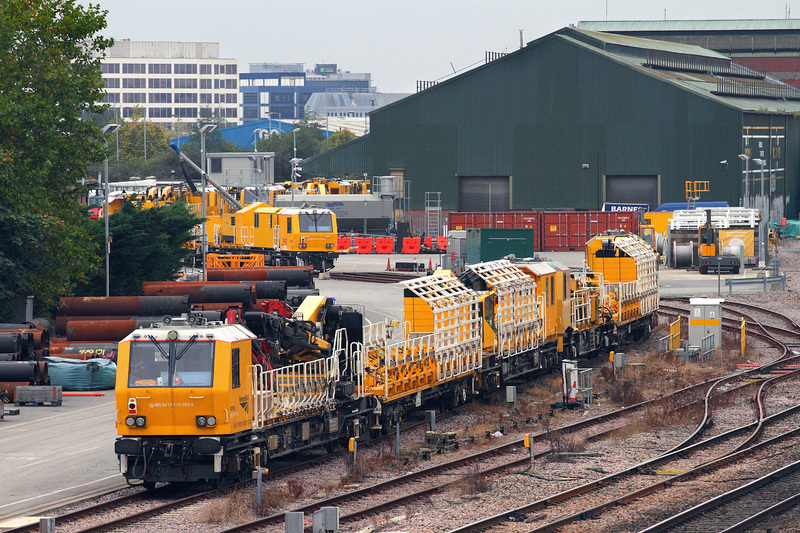 Pieces of Motorized Plant invaluable for maintaining the Network---Invariably painted Yellow with a few rare exceptions(MPV's). 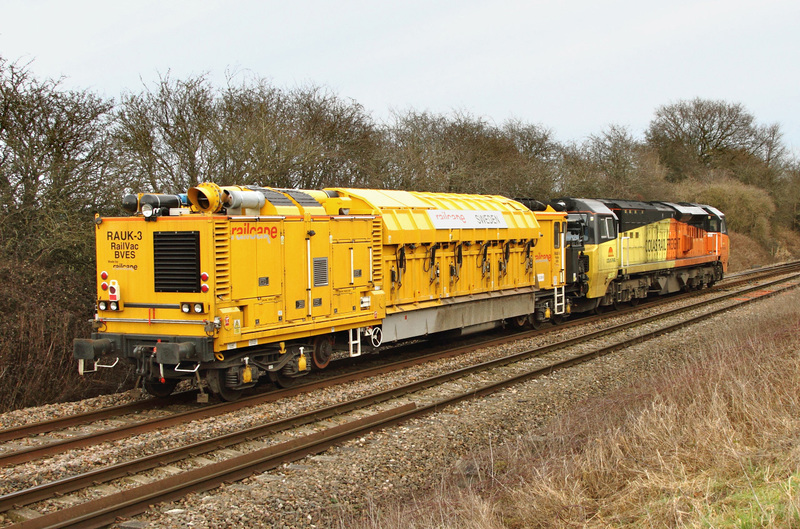 This odd looking machine DR80205 is a Network-Rail 'Pandrol Jackson Plain Line Stoneblower'. 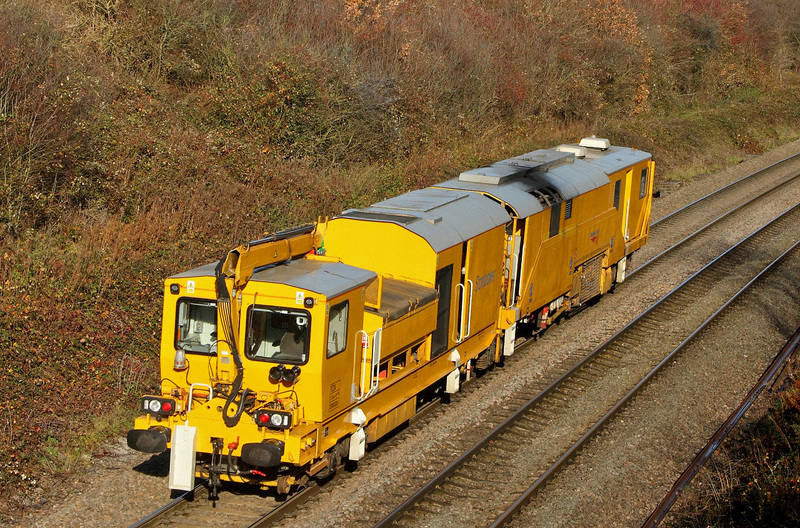 This machine is a technical marvel and is used to digitally assess the level of the stone ballast on the track during its first pass,and then add ballast where needed on its second run over the same section of track.Viewed at Clink travelling up from Taunton (11:30 departure) going only as far as Westbury. 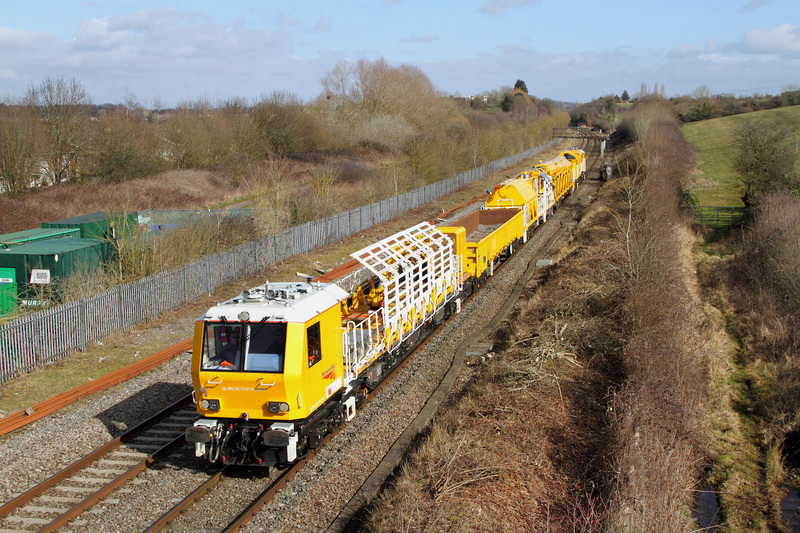 Here is a seemingly anonymous Stoneblower,a piece of Network-Rail Track Plant travelling from Broxbourne Down Tamper Sidings (10:15 off) going to Castle-Cary as '6U40'.An interesting piece of equipment! 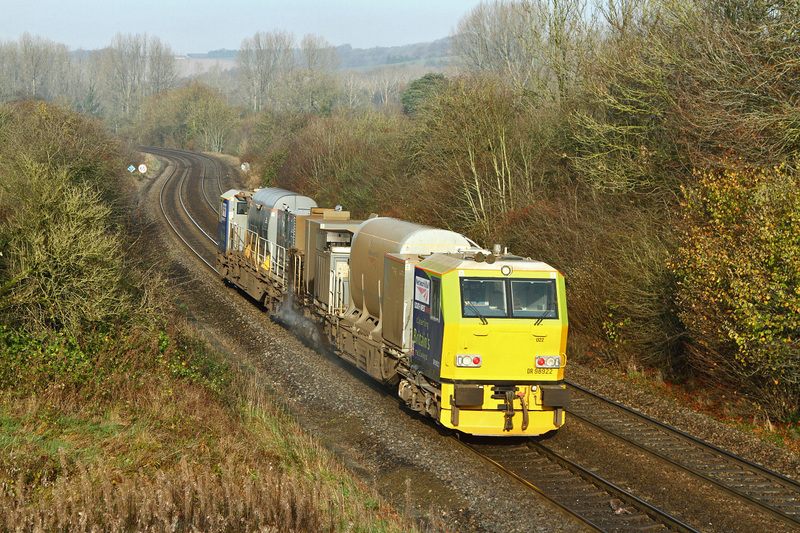 viewed here passing Cowleaze Lane in Bratton on the B&H. 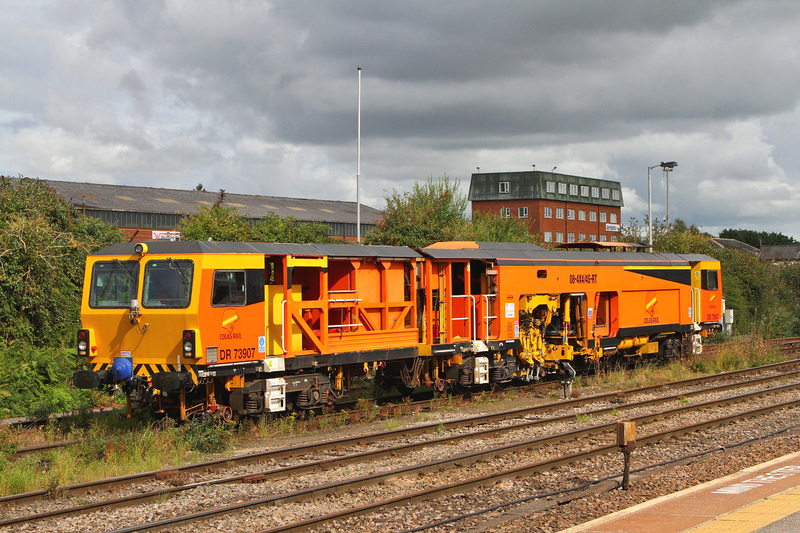 Another MPV on RHTT duties.This time it is DR98913/DR98963. 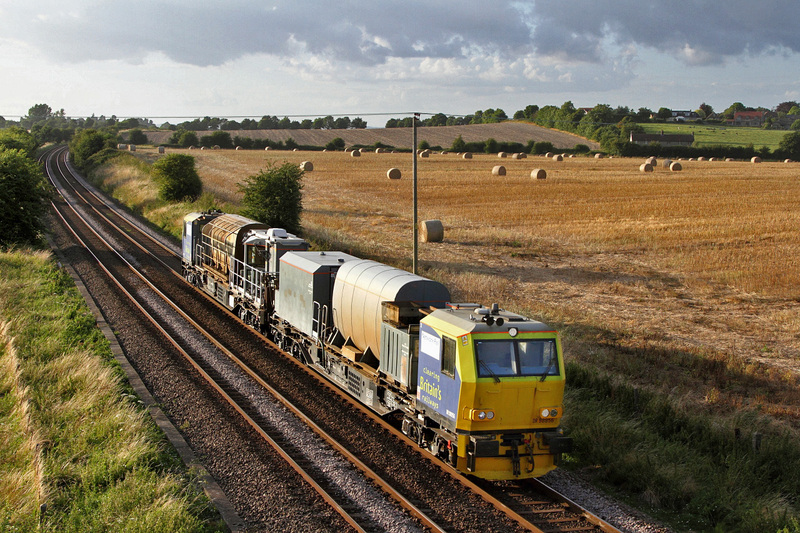 This time operating out of Effingham Junction.Its route extends as far west as Warminster and down along the South Coast.Here it is crossing over to enableit to reverse and take the Portsemouth line,having just come from Warminster via Southampton. 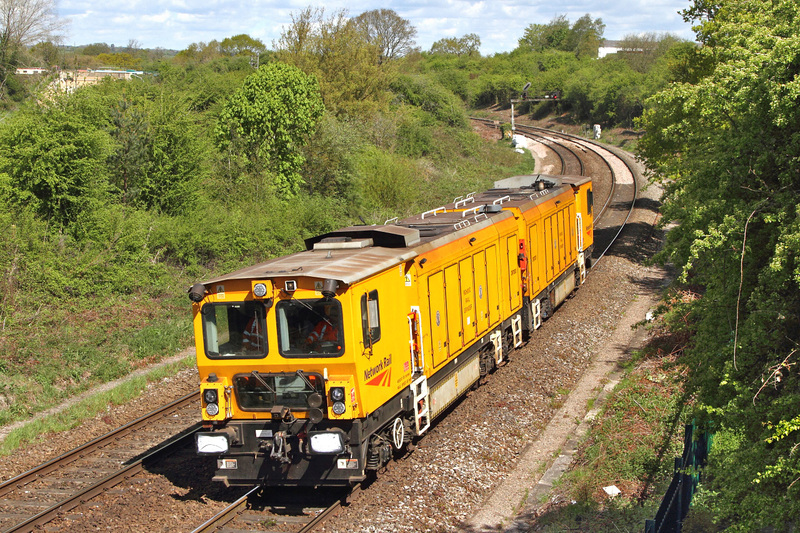 Network Rail in the south seem to make good use of their MPV's during the RHTT season.Quite a few routes are dealt with from a Base set up in Totton Yard.This one departed there this morning at 05:54 and has already travelled to quite a few locations in the region. 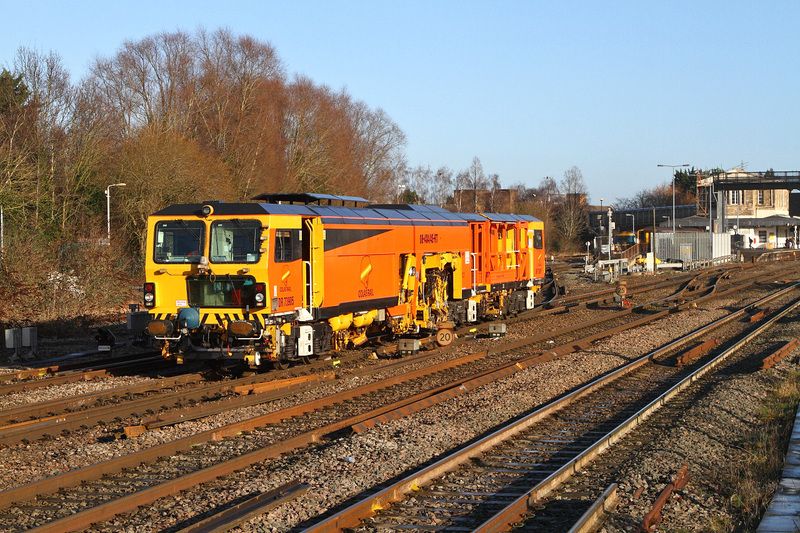 DR98977/DR98927 were making up this particular set-up.As can be seen it is jetting the railhead as it passed here on the approach to Eastleigh Station at Campbell Road. Although the light was pretty dire,this working was viewed purely out of interest because of the STP nature of it and its path. 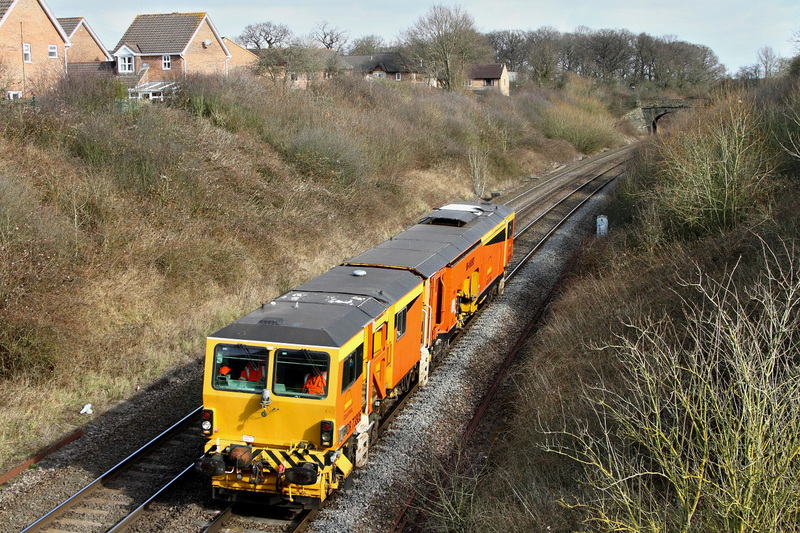 Its was listed as '6U19' the 13:05 from Exeter Old Yard-Waggoners Way and return via a short pause of 40 minutes at Westbury for a reversal.It was probably some kind of route learner/driver trainer as it certainly had no time to perform any tamping! 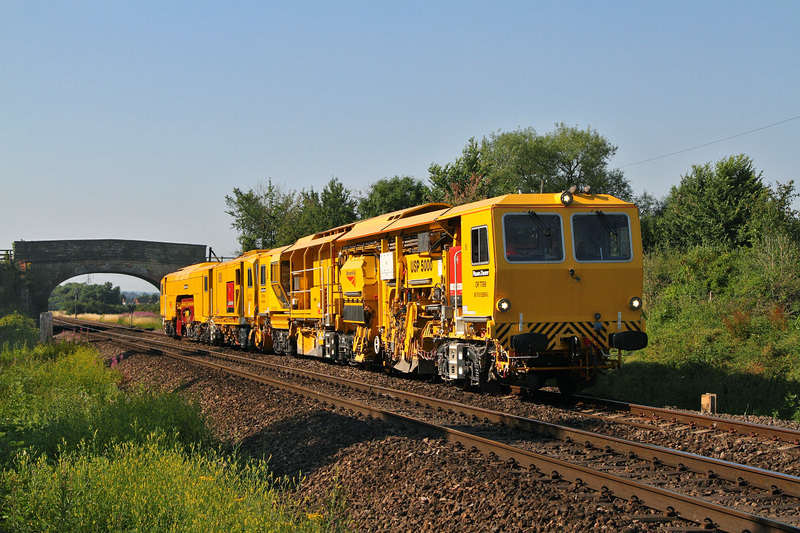 DR73113 a Plasser & Theurer 09-3X-D-RT type Tamper/Liner was the unit pictured. 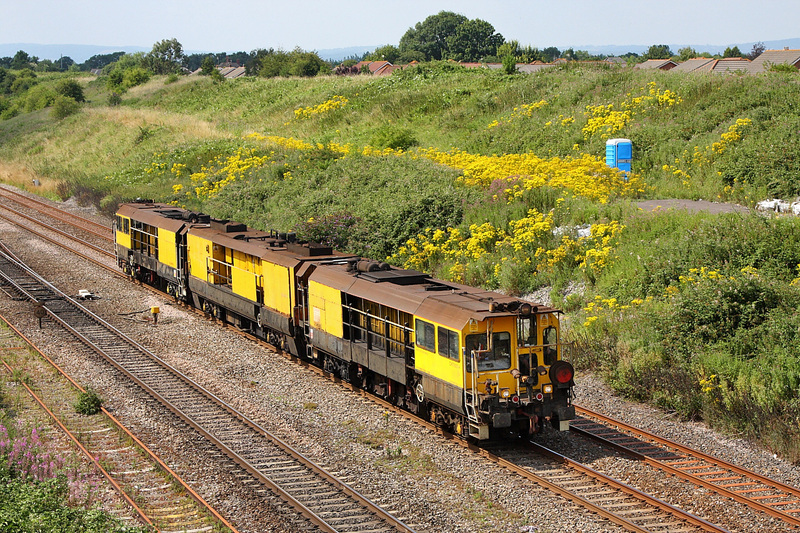 The rather immaculate looking Colas-Rail 'Plasser & Theurer 08-4x4/45-RT Switch & Crossing Tamper DR73905 motors down past Fairwood nr Westbury working from West-Ealing Plasser Sidings (10:47) down to Taunton.No doubt it has probably been there for a spot of repair and Mtce,Hence the condition? Without any fore knowledge of precisly what this working was actually going to be (I was kinda expecting either a Freightliner-GM or a Colas-GE) this pair of immaculate Track-Machines came as quite a pleasant surprise.It is nice to see a bit of non-GM variety occasionally! 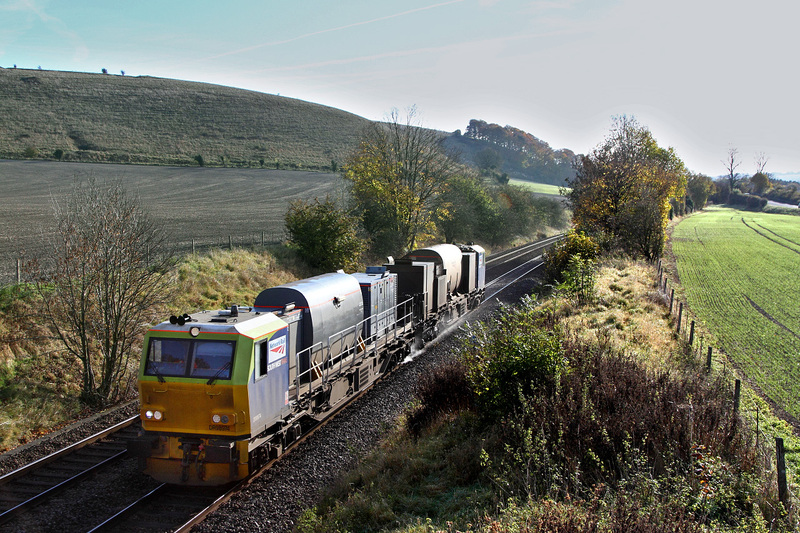 DR77909 with DR73120 are seen on the Frome Byline at Styles Hill with '6Q53' the 10:17 from Westbury-Up TC heading for Newton-Abbot's Hackney Yard.Obviously something to do with the HOBC activity of late down there recently. 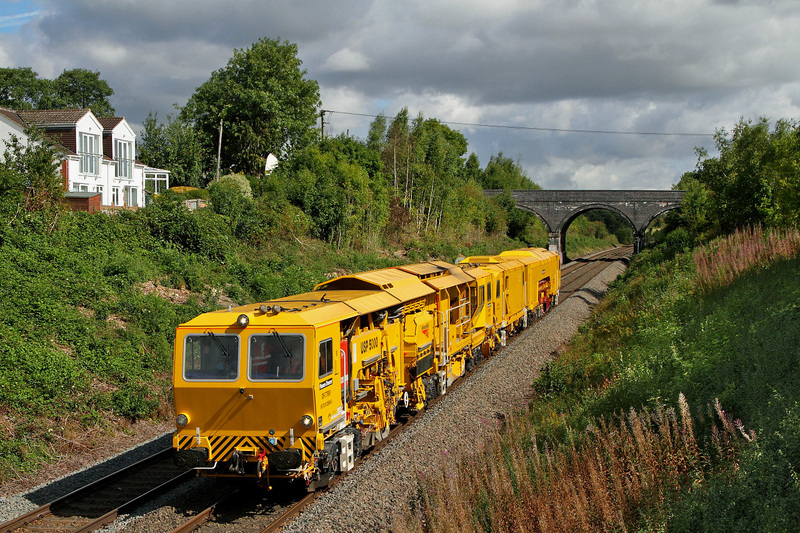 This seemingly almost brand new pair of Track-Machines DR77090 and DR73120 have certainly travelled quite a distance to get here.They departed Crewe-PAD at 11:33 this morning.Their destination being Westbury-Up TC.Viewed at Church Road Foot-Xing in Heywood Village nr Westbury. 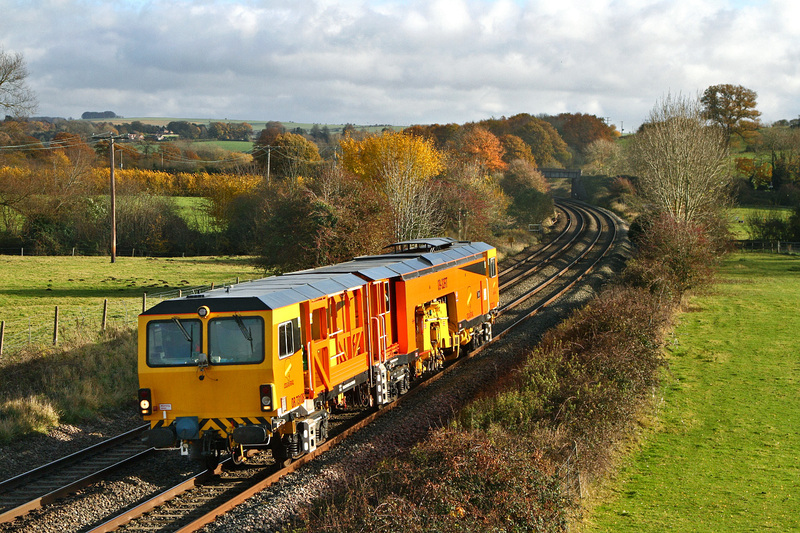 Largely ignored but still (I consider) an integral part of the railway scene,this pair of Tampers DR77907& DR73117 are viewed at Llandevenny on a transfer from Cardiff-Canton Taff-Vale Sdg's up to Reading Triangle Sdg's. Track-Machine DR75407 rattles up the B&H at Great Cheverell working from Crediton (09:50 off) going via Reading to Swindon-Cocklebury.Seen at a slightly shadowy but still quite nicely lit Great Cheverell. 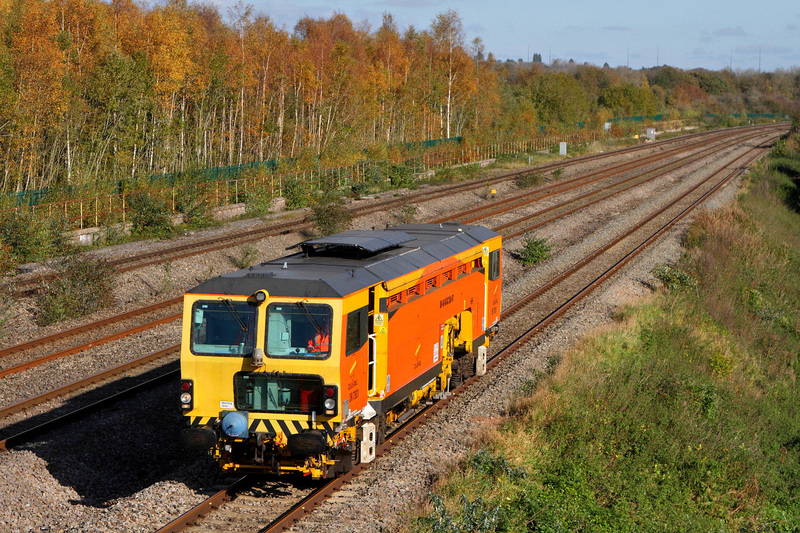 4-wheeler Track Machine DR73931 chugs down ther slow-line here at Undy coming from Castle-Cary-CE (10:00 off) and tripping to Cardiff Canton-Taff Vale Sidings.Note the autumnal tall trees in the background.This area used to be the western-end throat of the extensive freight yards that existed here at Severn Tunnel Junction a few decade ago.All gone now as is most of the once thriving freight scene here in S-Wales. Viewed passing the freshly manicured lawns at Masters Crossing. Colas owned and operated Plasser & Theurer 08-4x445-RT Switch & Crossing Tamper DR73907 rolls into the holding sidings on the 'Up' side at Westbury.Viewed off the passenger platform on the station. 'Colas'Track Machine DR75407 heads towards Bristol through Oldfield park in Bath.Bit of a mystery working this as nothing was shown anywhere giving any clue as to the start point or destination? 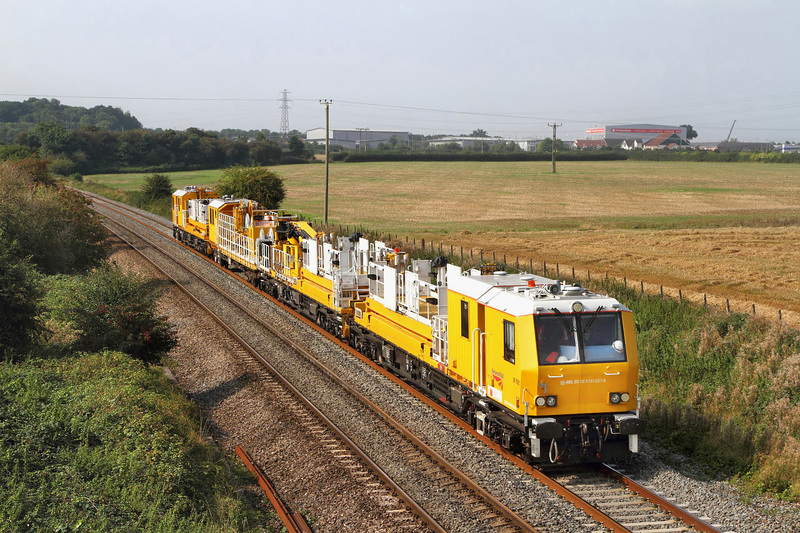 Another look at DR76914/DR76910 as it passes Fairwood nr Westbury These Windhoff Track Machines were supposed to revolutionise the installation of bases and masts on the GWR electrification scheme. Mainly they have failed spectacularly but at least it still looks fairly immaculate.Probably due to lack of use because it was not up to the job! 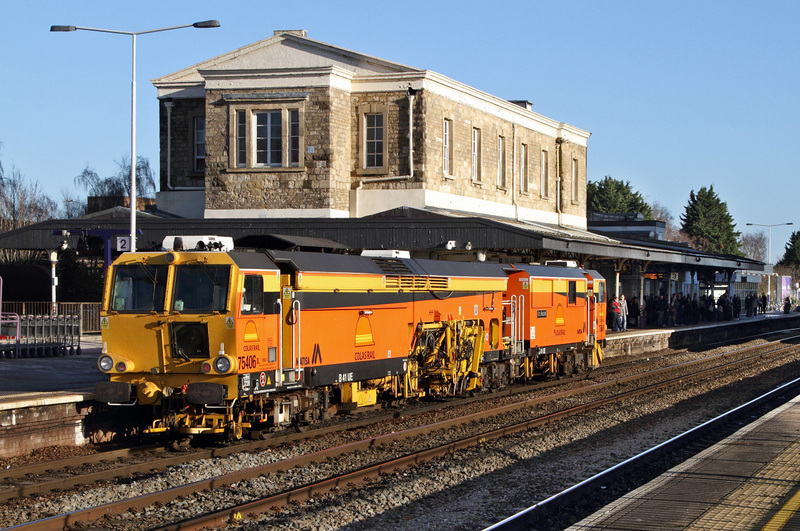 The train was on a Swidon to Taunton and return trip probably for crew training purposes.It ran as '6H08' and departed Swindon-Xfer at 11:03. 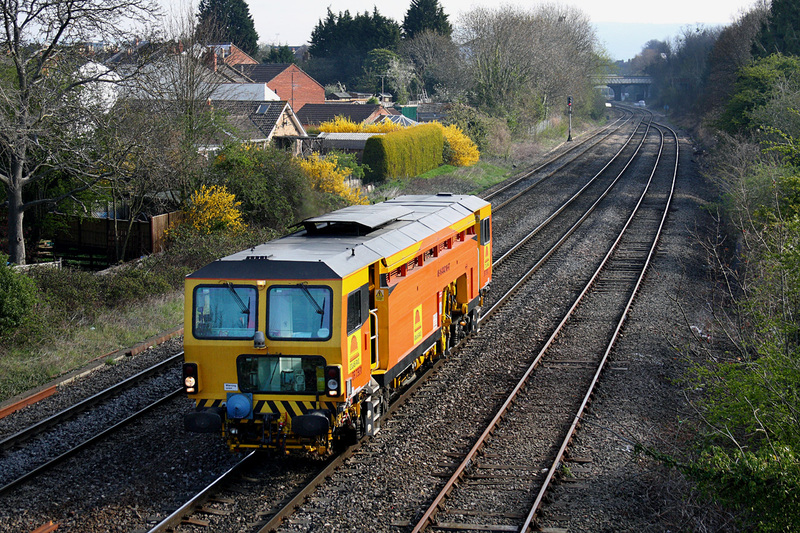 This Windhoff Electrification Unit DR76910/DR76914 today had a jaunt from Swindon-Transfer and back via Taunton.It ran as '6H08' the 11:03 from Swindon.Here seen on its return leg approaching Westbury. 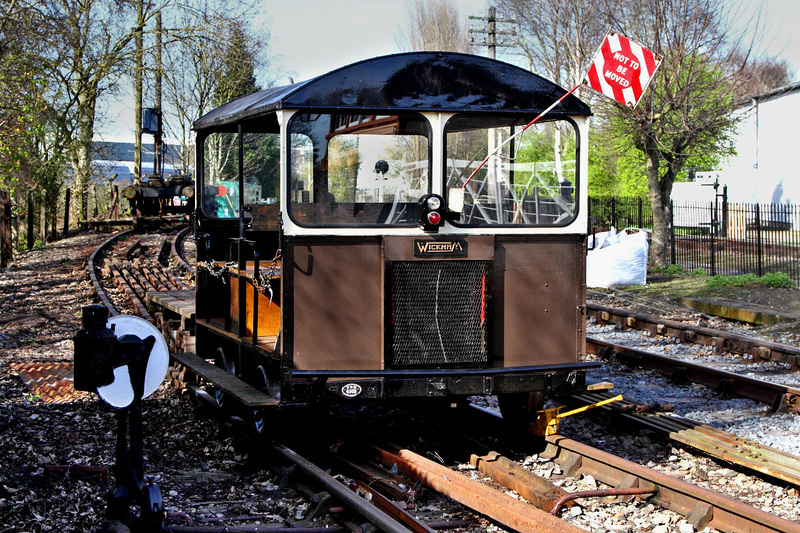 This is a Gangers-Trolley type 27A manufactured by 'Ware'-Wickham Works No-7506 in 1956.Its number is PWM-4303 and has failrly recently been fully refurbished and given a coat on non-authentic GWR paint.These liitle machines were once quite common but nowadays none are used by ganger-type staff anymore.Ford Transits being the modern preferred option! Viewed parked on the 2nd demonstration line at the Didcot Railway Centre.Note this viewing angle was only possible because it was a non-running day here today. 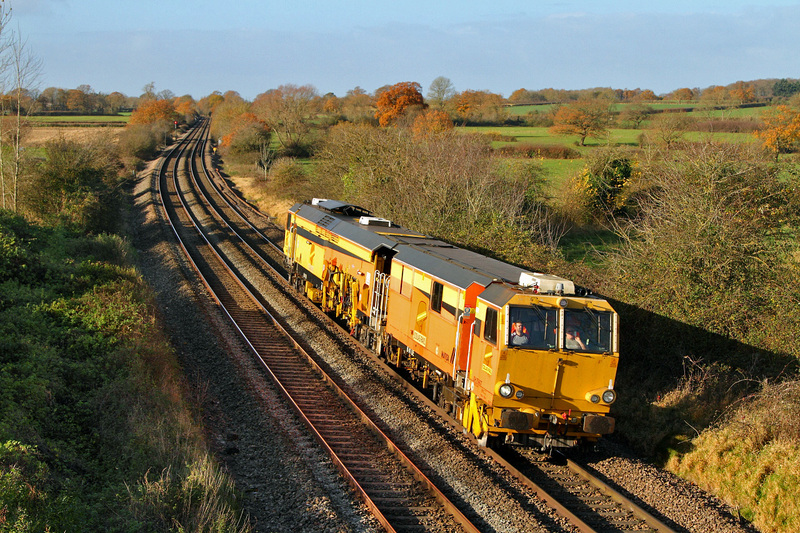 Colas owned and operated Track-Machine DR73905 rattles through Swindon as it takes the Kemble route with the 10:30 from Southall-Isu (S&Te) travelling up the Horton Road at Gloucester. 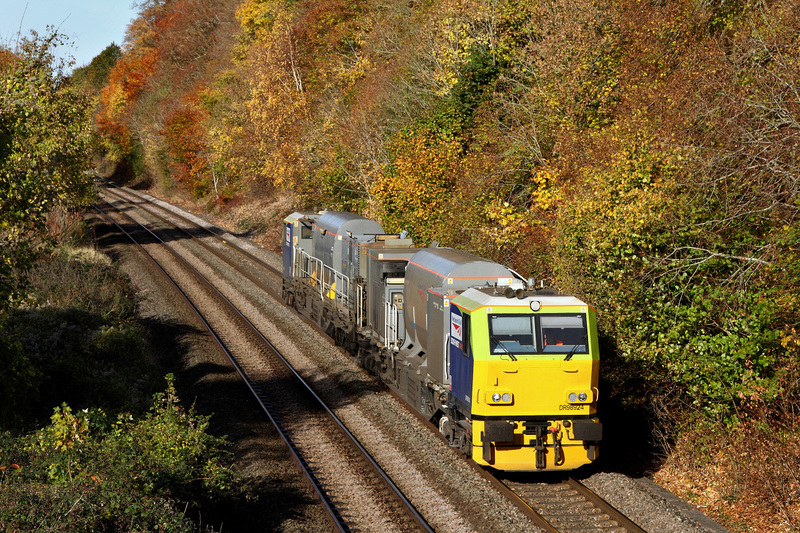 to Westbury.Here passing Great Cheverell in a brief splash of autumnal sun. 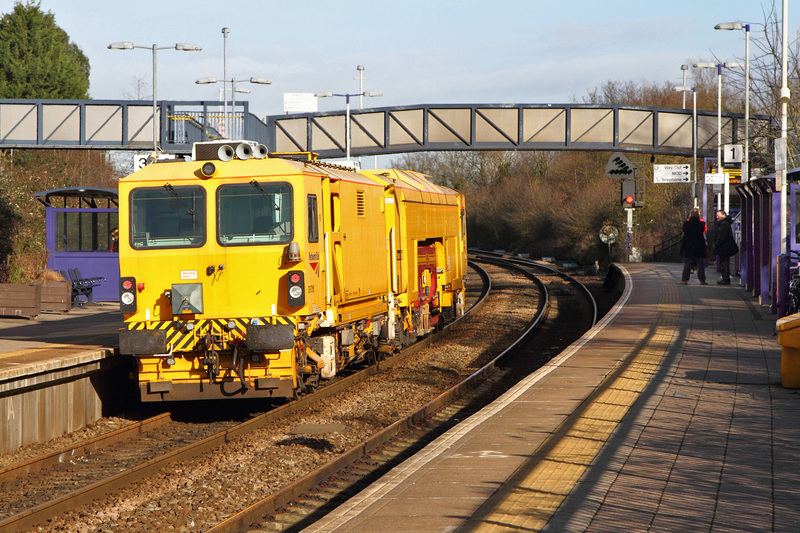 final leg of its morning work with its trip back to Eastleigh-Arlington. 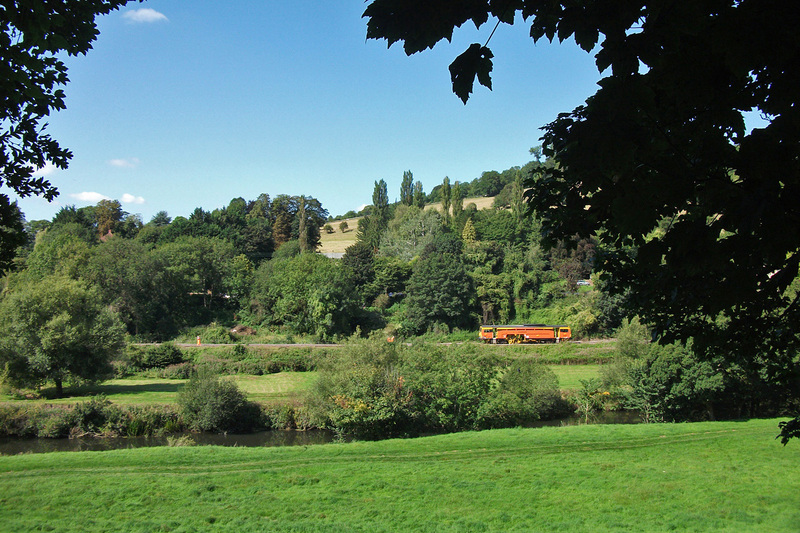 Bavant in the Wylye Valley. is seen at Norton Bavant coming out of the sun like a japanese WW-2 Zero! DR98974 leads with DR98924 being rearward.This departs Eastleigh at 05:05 and does a large swath of the south finishing up with a trip up the Wylye Valley as far as Warminster before returning to Eastleigh.Odd really as it follows another RHTT '3J23' just 15 minutes ahead of it ???? 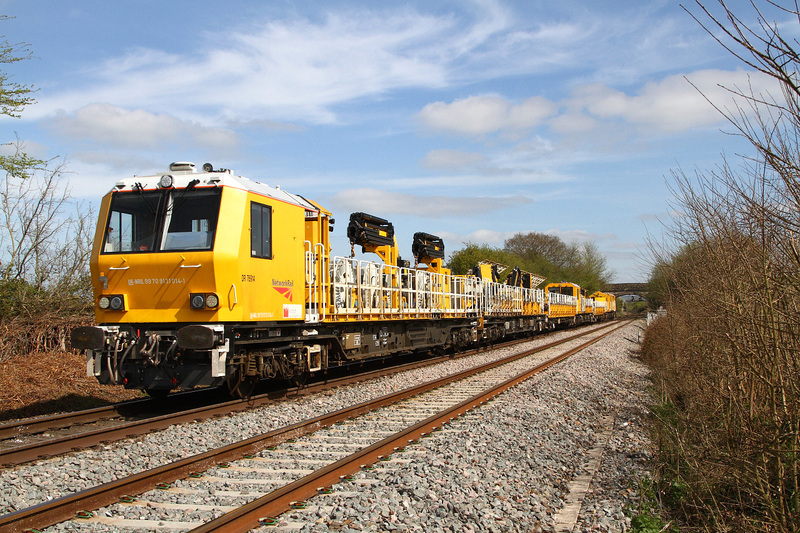 whilst the crew changes ends for its return trip to Salisbury and beyond. the network in the south! 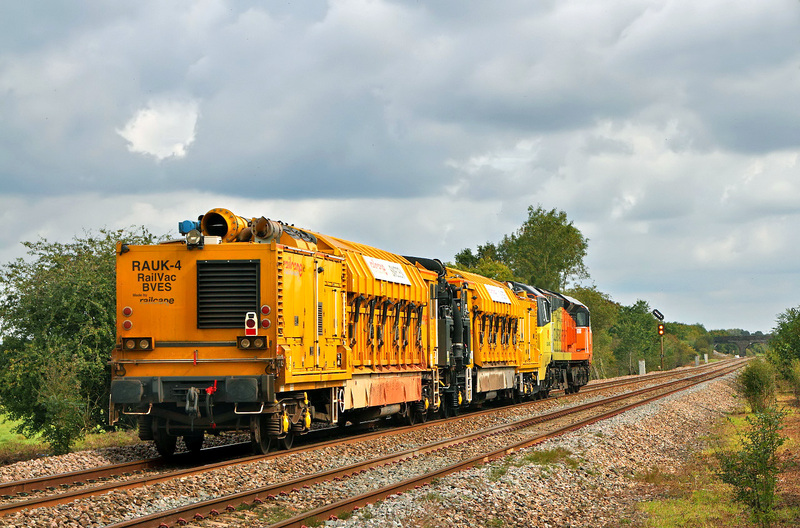 recognition code also being stencilled on the nose as well.That is too long and complicated to bear consideration.Hopefully we will never see these things in our area doing the job they are designed for--- ' electrification'. Its bad enough having it on the GW mainline to Bristol! 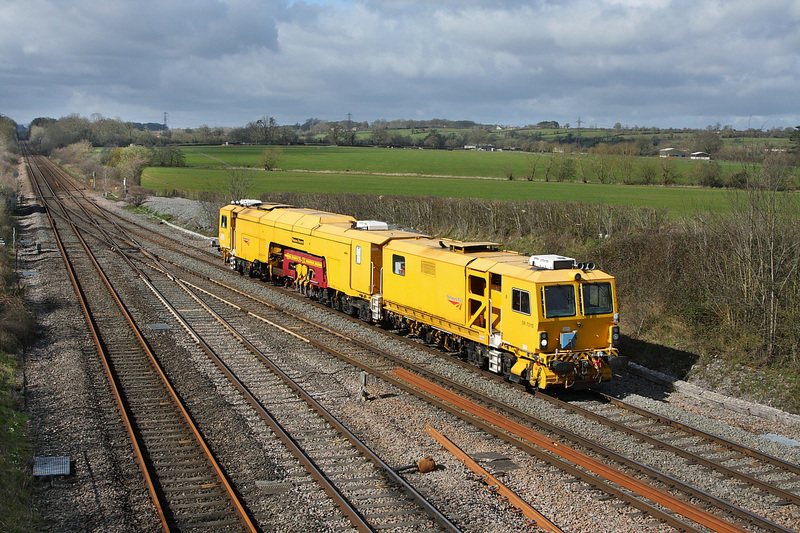 jolly to Taunton and return to Swindon-Transfer as '6H05'.This is the one that actually installs the masts on the pile-driven bases.Several were still loaded in the centre section.Numbers were DR76922/DR76913. Also it has a european style number UK-NRIL 99 70 9131011-7 on the front panelling. that is now long gone on Test trains oad locomotives. 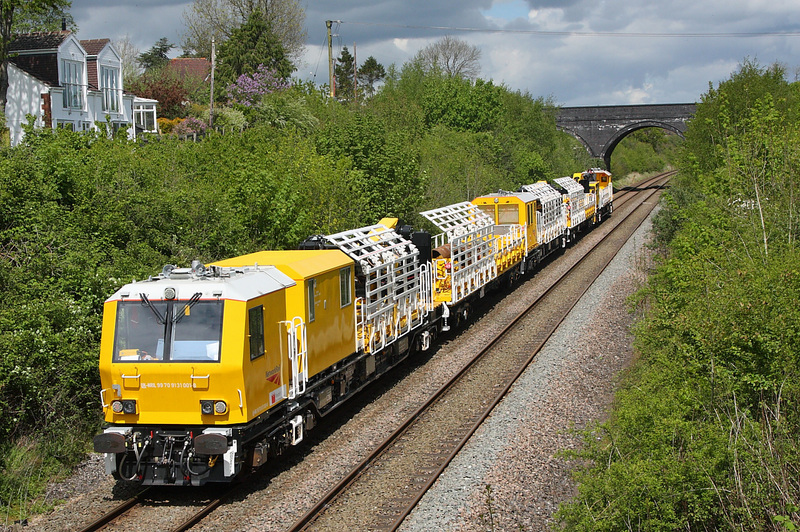 '6J83' the 10:45 from Cardiff-Canton Taff Vale to Slough Estates which is merely a 'Plasser' Track-Machine DR75406 'Eric Machell' drones through Pilning on its 100 mile (approx) transfer move.As can be seen from the livery this particular piece of equipment is owned and operated by 'Colas' in the now familier yellow/orange colour scheme. 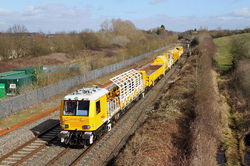 DR73116 a Plasser&Theurer Tamper motors up through Filton Abbey Wood on a fairly long distance journey '6U43' from Taunton (10:25 off) going to Rugby D.E.D which is apparantly the 'District Electric Depot'.It finally arrived there at 16:45 so a total journey time of just over 6 hours!!!! 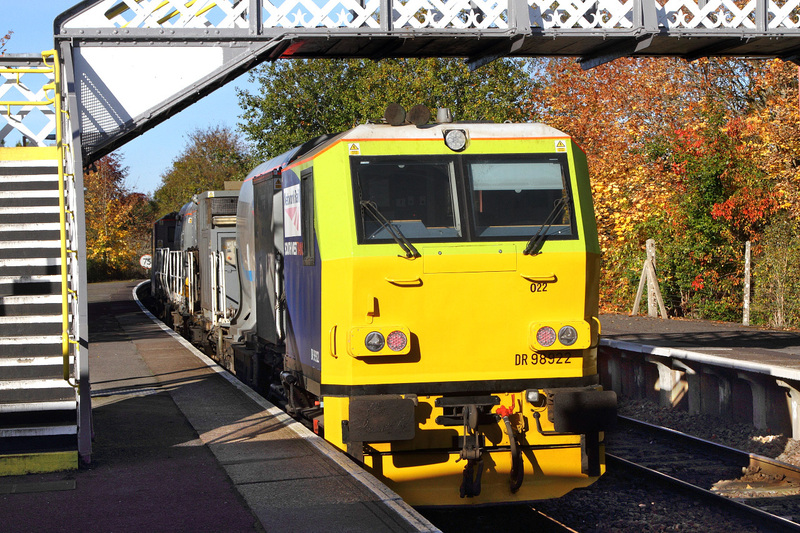 MPV-pairing DR98924/DR98974 ambles over Townsend-Crossing in Wylye with '3S80' which originated at Eastleigh-Arlington this morning at 05:04.Having jetted many routes east of Eastleigh as far as Guildford its final session is up from Salisbury to Warminster then returning to Eastleigh to finish its mornings work.For sure this is the final week for this duty as the majority of the other RHTT duties throughout the country have now finished. 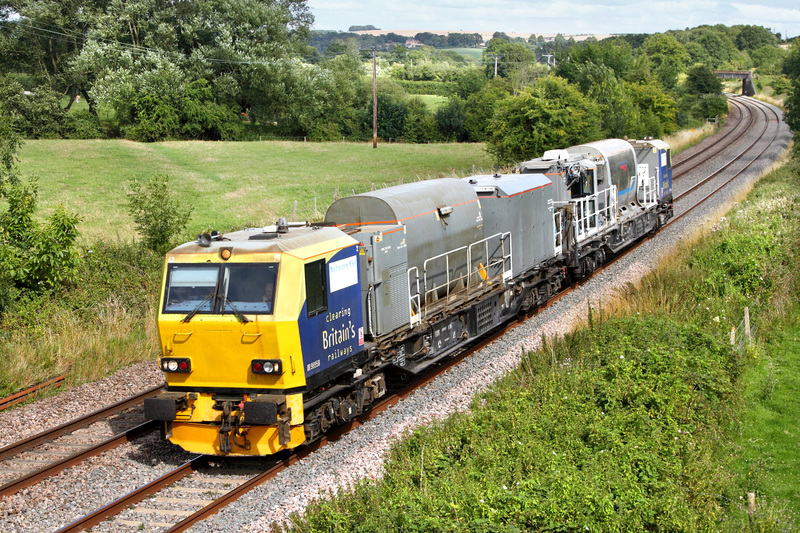 MPV pairing DR98972 and DR98922 on active water-jetting,leaf busting duties passes Sherrington with '3S80'.This duty covers most of the South Coast and finishes off before returning the Eastleigh (Arlington) with a trip as far as Warminster up & down the Wylye-Valley.It commenced this duty at 05:04 from Eastleigh this morning. 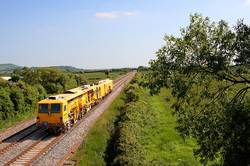 Colas operated 'Plasser and Theurer 08-275 Switch and Crossing Tamper' Nunber- DR73901 is viewed across the River Avon at Dundus in the Limpley Stoke Valley busily tamping the recently relaid section of track here under the Dundus Aquaduct.Naturally the line is closed to regular traffic whilst this rather slow operation is being performed. 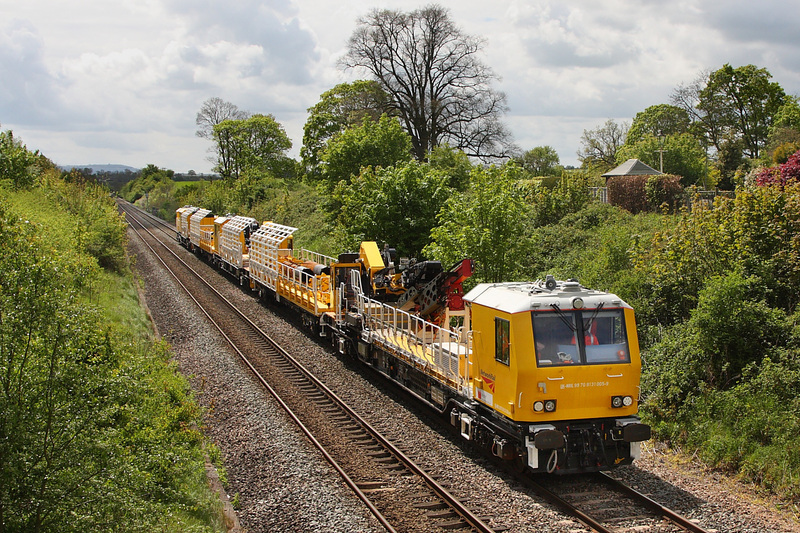 With the amount of heavy rain and cloud we have been experiencing this week even though it is supposed to be High Summer this lowly Track-Machine becomes an attractive proposition if the sun is shining! 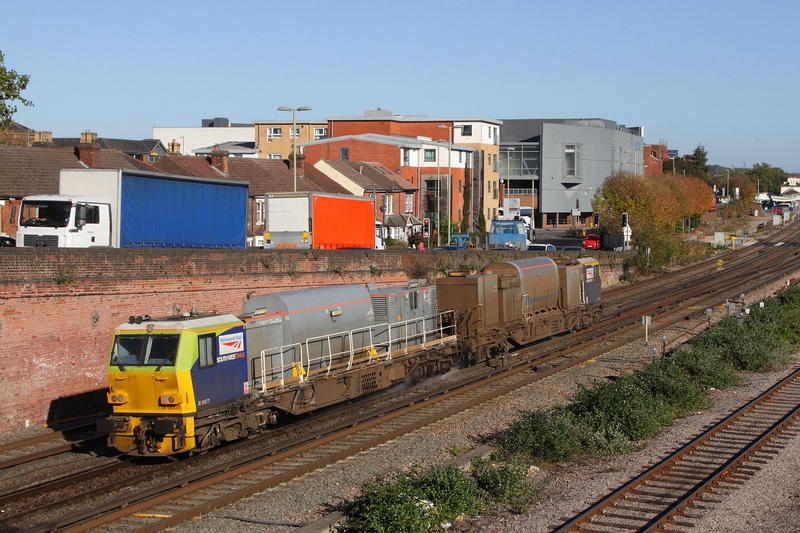 So here is a Matisa-B4I UE ZWA No-DR75406 'Eric Machell' heading for Bristol's Kingsland Road S&Te sidings via Taunton.Its booked departure from Bradford-Junction was 15:30 nominally but actually left 40m late.No doubt it has been involved in sorting out the new track that was recently installed at Bathampton for the Electrification Scheme there. 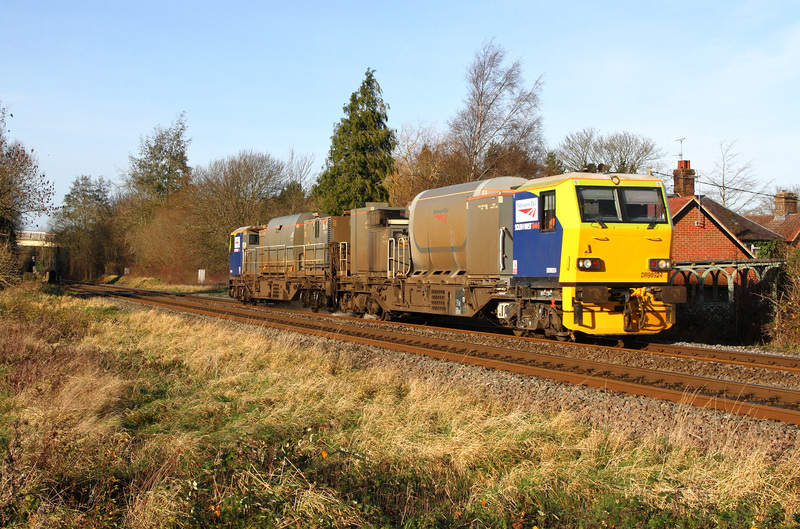 MPV-duo DR98958/DR98908 were today taking the 'Long Way Round' travelling from Didcot-TC (departing at 14:06) going down to Exeter-Old Yard/Waggoner Way.No doubt if the route via Bath-Spa was open it would have travelled that way.Seen at Great Cheverell still wearing one of the older Network-Rail livery styles. 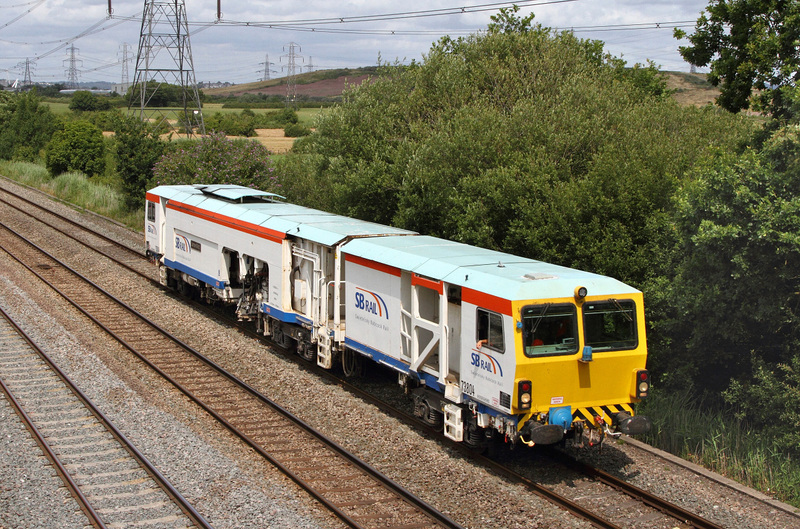 Track Machine P&T08-32U-RT(Tamper) DR73804 'James Watt' formed this move, the 14:30 from Maindee North-Junction to Port-Talbot.This is the first time I have encountered a white livery on Track-Plant.Indeed the owning company SB-Rail --'Swietelsky-Babcock Rail' is totally new to me as well.Anyway here it is passing Duffryn just west of Newport-ADJ. 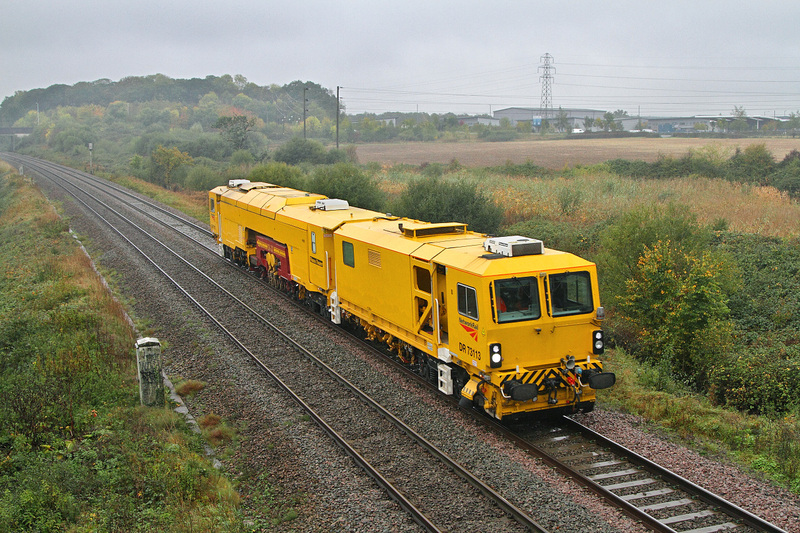 Apparantly this machine has spent most of its life in Scotland where this Company SB-rail (and Livery) usually operate.So to see it this far south is quite unusual unless it has now been permanantly transferred ??????? 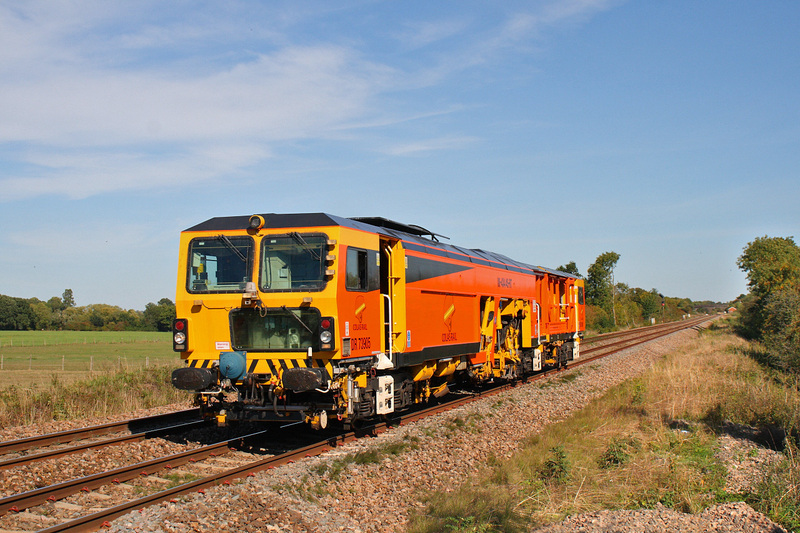 Apparantly this is a ZWA-Harsco RGH20C Switch & Crossings Rail Grinder.The identity is DR79263/DR79273.It was making its way from Didcot Fueling Point to Westbury as '6U03'.A fairly interesting piece of NR-kit giving a pretty good impression of a locomotive of sorts.They are always worth a picture if the opportunity arises.So here it is passing Ladydown nr Trowbridge having just come off the Melksham Line from Didcot. 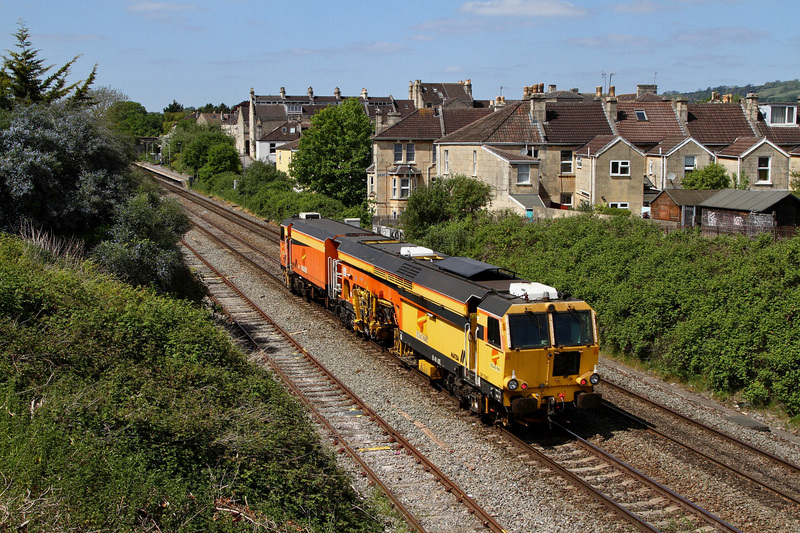 Colas liveried Plasser&Theurer Tamper DR73805 rattles down past Clink Road Junction in Frome coming from Westbury (10:20 off).It was originally booked to go to Tavistock-Jn in Plymouth but for some reason its journey was curtailed at Totnes. 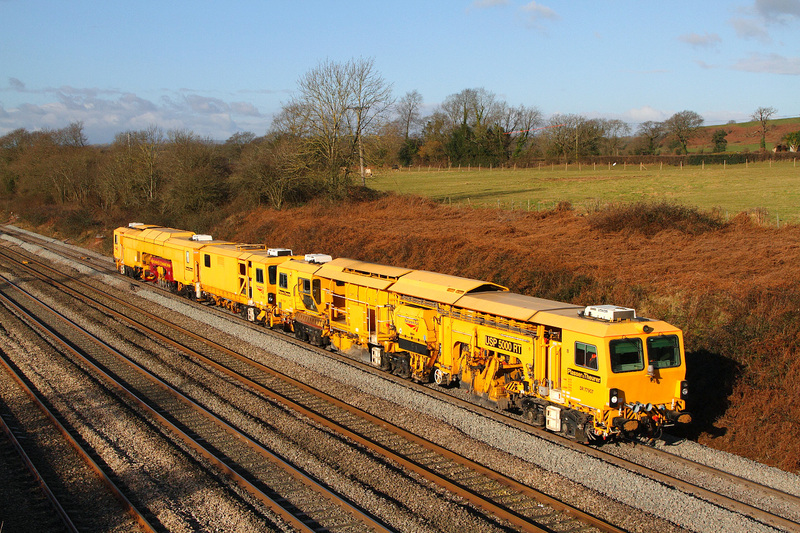 This is a crew training run from Swindon-Transfer (12:00 off) to Bridgend. 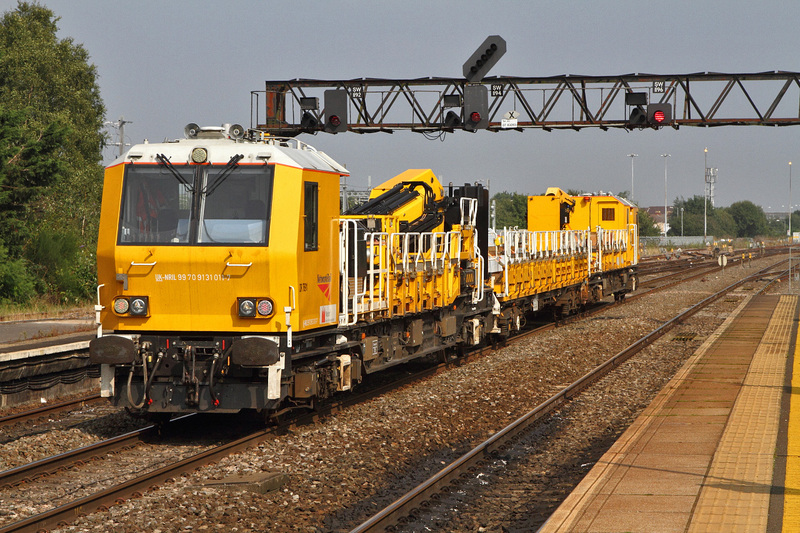 Listed as'6H03' It was utilizing M/C is one of the Windhoff Contraptions that have been and are still responsible for the OHLE lineside equipment from Paddington to all points up to and including Bristol and cardiff eventually! 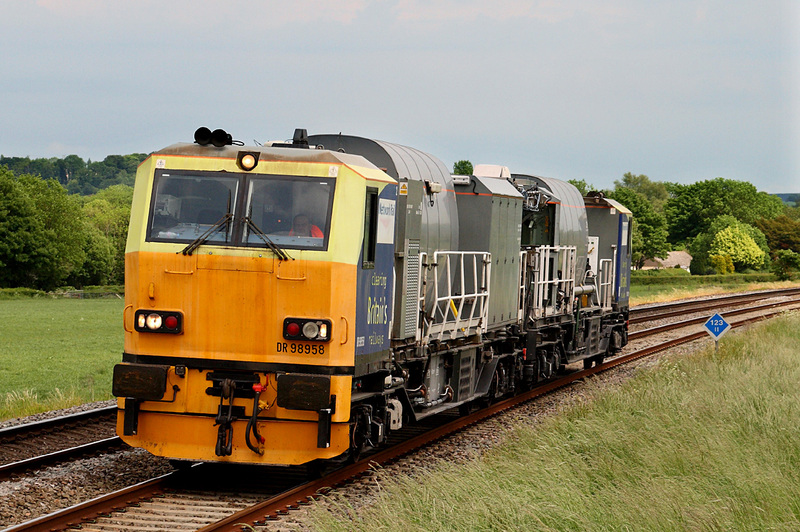 This particular unit is DR76906 (9870 9131 006-7) back to back with DR76910 (9870 9131 010-09). I think this particular combo is mainly responsible for concrete mixing and supply on site etc.It is viewed passing Wapley Hill near Westerleigh Junction heading west. 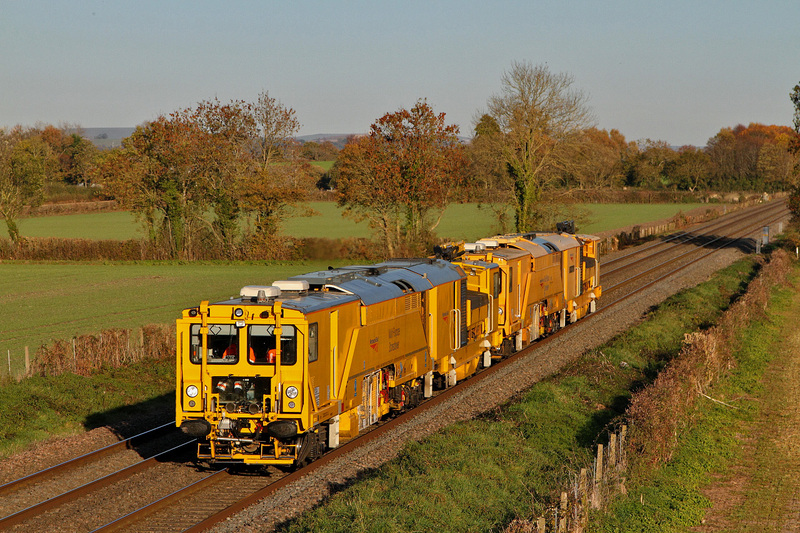 Here is a closer look at the Swedish-RailVac as it passed Fairwood whilst being transferred from Goodrington Sands nr Paignton up to Westbury as '6C51' by 70804.Being a Network-Rail owned piece of track plant is finished in the standard livery of all-over yellow. 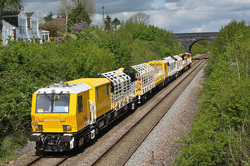 There are 3 in the country and this is the newest one introduced and is normally based at Doncaster. 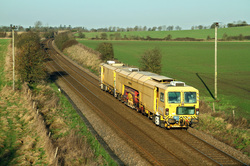 Plasser & Thuerer Track-Machine DR73111 'Reading Panel 1965-2005' passes Arn-Hill nr Warminster with '6U17' the 09:37 from Taunton-Fairwater Yard going to Woking. 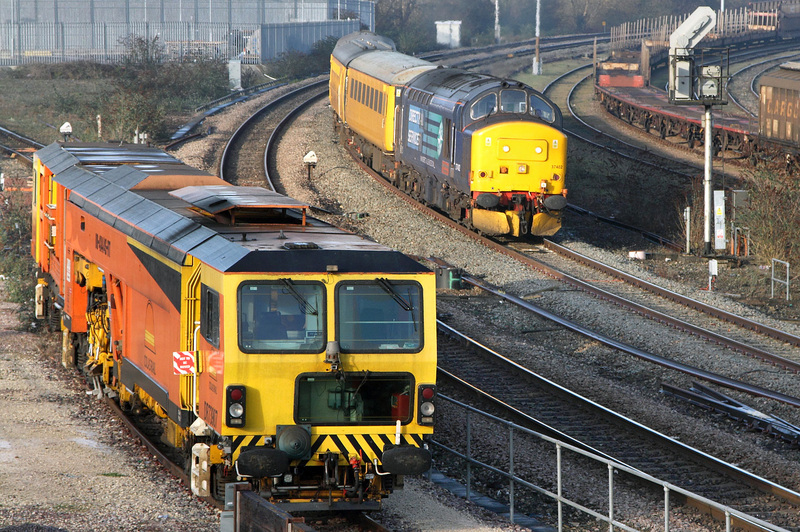 '3Z01' from Tyseley going to Hither-Green arrives at Didcot with its three coach test-train.It is hauled by 37402 and is about to pass a stabled Track-Machine DR73907 parked it its holding-siding here. 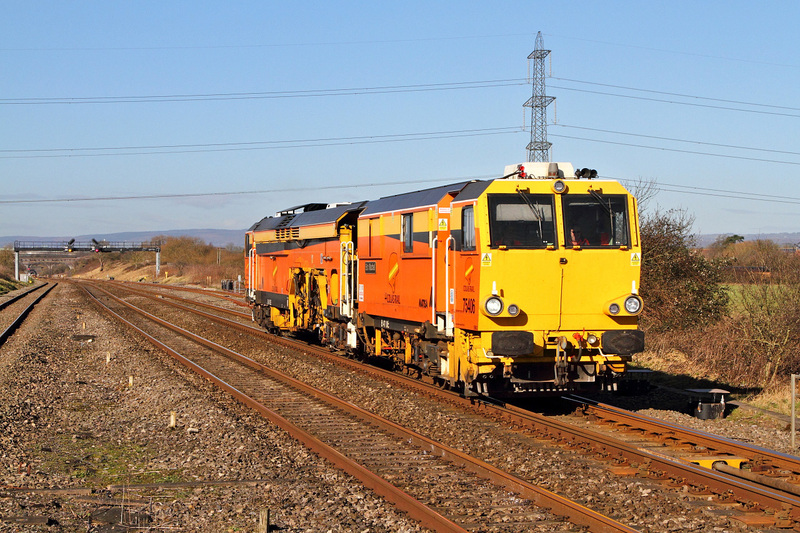 Colas-Rail Matisa-Tamper DR75406 'Eric Machell' pauses briefly at Swindon during a transfer move from Bristol-Kingsland Road to Reading Triangle Sidings. Windhoff-MPV pair DR98924/DR98974 currently configured for rail head treatment runs through Sherrington Lane in Codford heading for Warminster.Here this working '3S80' reverses and returns to Eastleigh-Arlington to end its shift.So far it had been roaming around the south of England since 05:00,about 6 hours so far. Unbelievably just 7 minutes after the St Blazey based RHTT passed busily jetting the railhead another one appeared doing exactly the same! 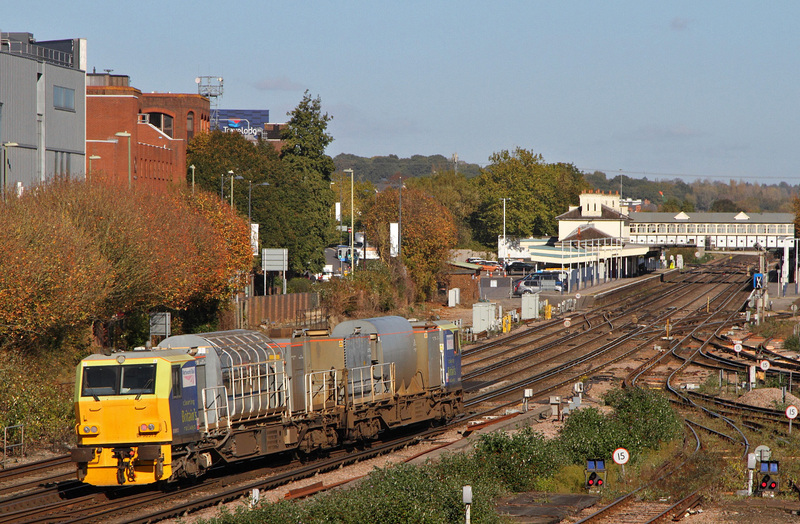 This one was doing a circuit around the South of England starting from Eastleigh (Arlington) and finishing there as well .Its report number is '3S80' (S for sandite ?) 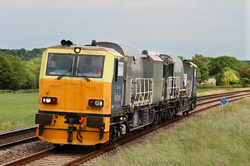 and uses one of the Windhoff built MPV's.This pair DR98972 leading with its mate DR98922 on the back.Seen passing the still wet track at Norton Bavant heading for Warminster where it will reverse and head back towards the Southern. 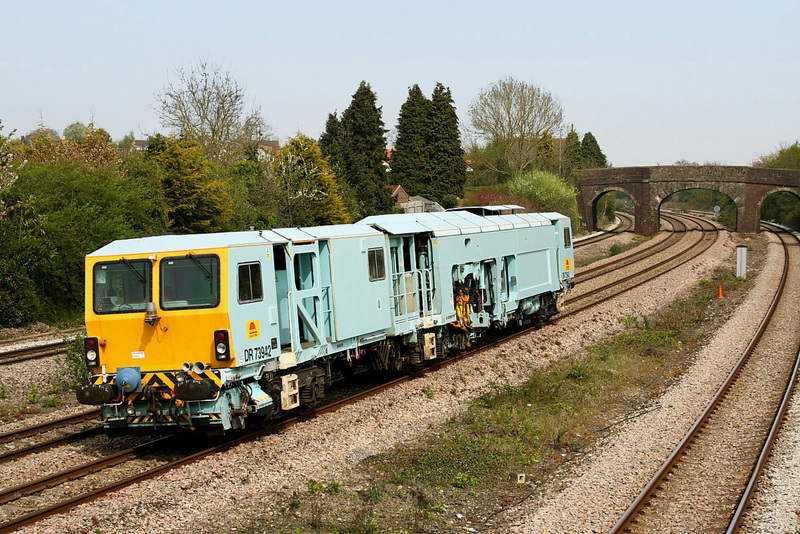 Here are a couple of 'Plasser&Theurer' track machines on transfer from Gloucester Horton Road going to Andover.Both carried cast nameplates.DR77903 was 'Frank Jones' whilst DR73111 was 'Reading Panel 1965-2005'.In the distance is Oldfield Park Station about a mile or so west of Bath Spa. 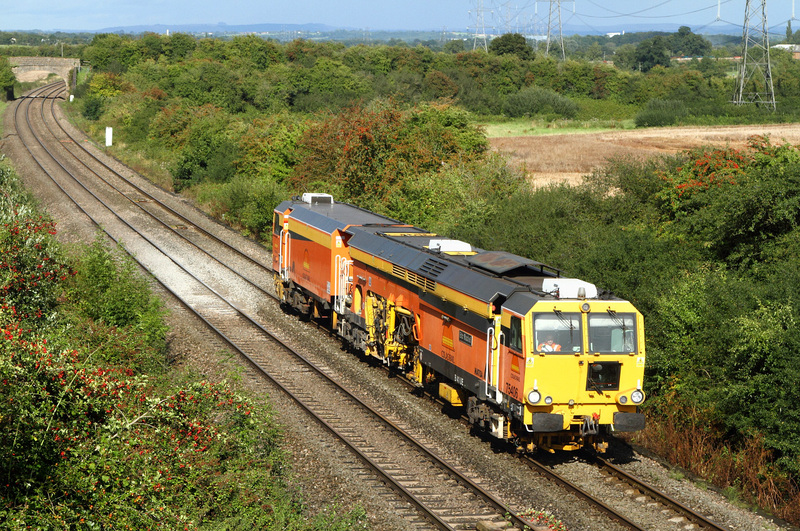 An Infrastructure move between Hereford and Reading -Triangle Sidings is viewed passing Pilning just east of the Severn-Tunnel. 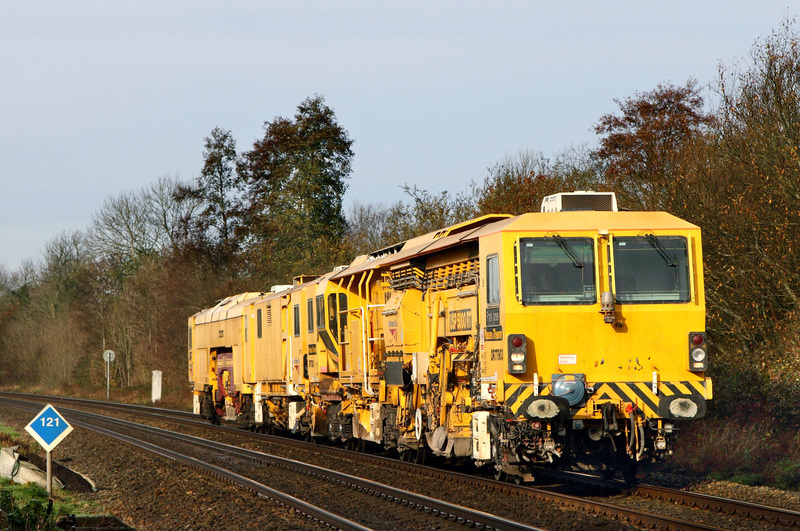 This siamese pair DR79200 A/B is a Rail-Grinder manufactured in Germany under the name of a Schweerbau-SPML15. Note the porta-loo on the cutting side.Its been there for years.I expect Railtrack are still paying the monthly hire charge and don't know it and don't care! 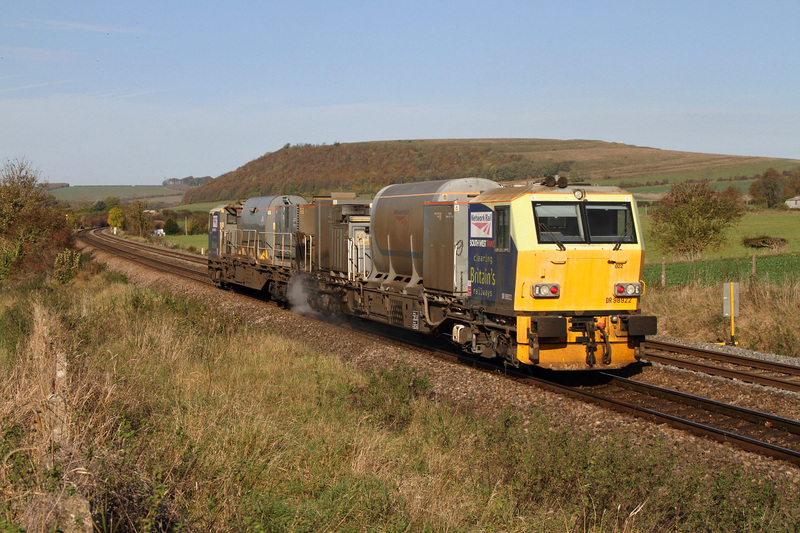 UK-NRIL-99703131001-8 whilst the UK-NRIL-99703131005-9 was leading. 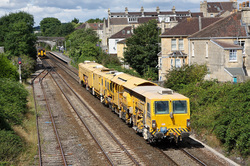 Lighting for this shot was rather poor as it was missed in the morning in better light, it having gone via Frome Station..However some kind of record shot had to be done! Hopefully this piece of equipment will never be used in anger around this location! This is the Windhoff Electrification-OTP/MPV out on a long distance crew training run '6Y61' from Swindon-Transfer to Swindon-Tranfer via Melksham.The Unit has been in this country now since being imported at the beginning of the year.Because it has not yet started work setting and constructing mast-bases on the GWML yet it is still pretty much in ex-works condition.Its number is UK-NRIL-99709131005-9 whilst the other end is UK-NRIL-99703131001-8. Yuck! yet another piece in a very big sad jigsaw! 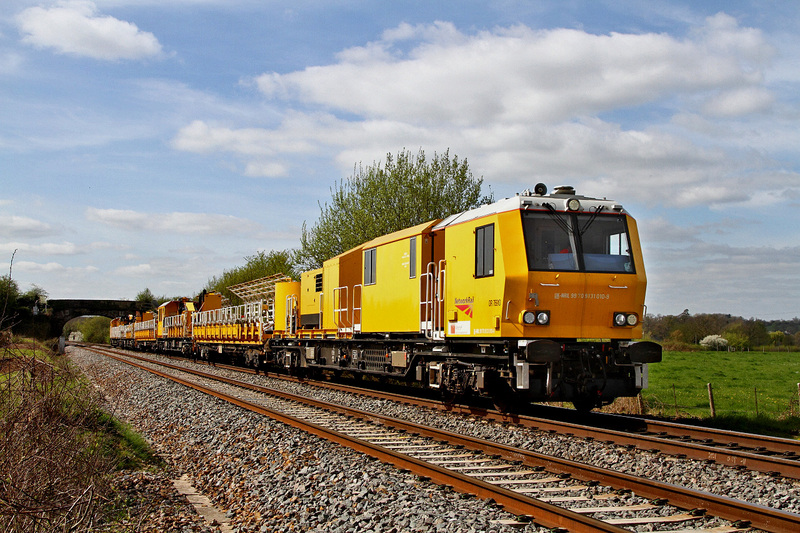 An almost blindingly bright Network-Rail Tamper/Liner,Plasser-Theurer 09-3D-RT number DR73115 cruises over Fairwood-Junction on the approach to Westbury.It has travelled up from Taunton's Fairwater-yard and is going to Gloucester-Horton Road. Note the very rusty down mainline off the Westbury Avoiding-Line.This piece of track has been out of use now for quite a long time since the severe floods caused an embankment to slip badly where this line goes over Station Road in the middle of Westbury itself. Work has been going on now for many weeks repairing this damage.It involves some quite serious groundworks involving deep piling plus the construction of a road to gain access to the slippage area. Its not only the Dawlish Sea Wall that was badly effected by the recent floods! I've not noted an MPV on the move for well over a year then suddenly I see two in as many days! 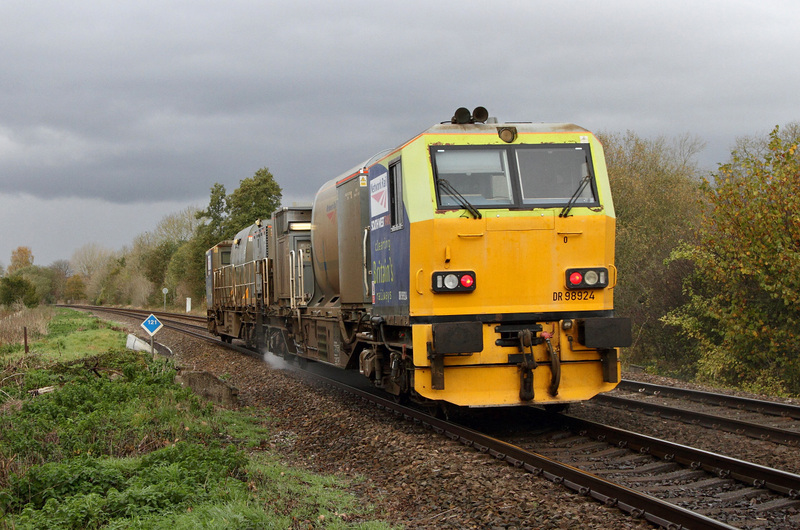 Here Paired-DR98959/DR98909 are seen passing Bapton in the Wylye-Valley on '6Z05' from Eastleigh going to Bristol-Barton Hill.Again this one looks to be set up as a Weedkiller-Unit.An interesting front-end design bearing a strong resemblence to a Class-60! 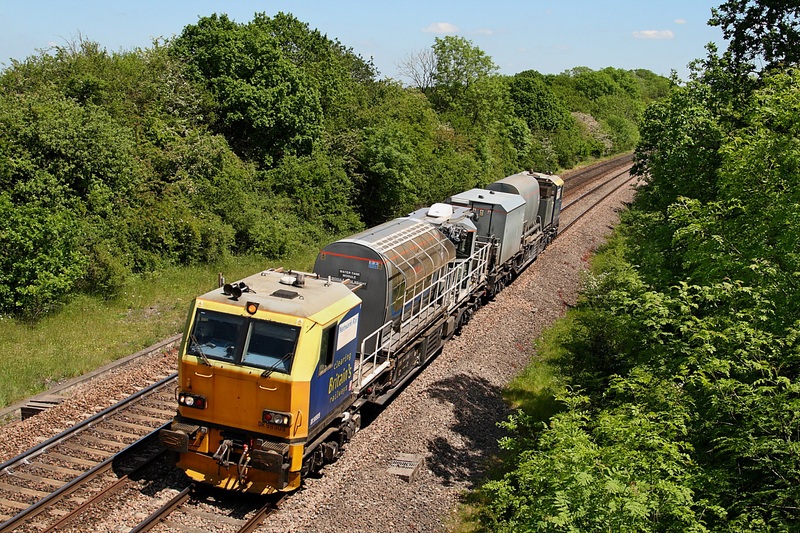 Coming from Bescot as '6Z10' this MPV DR98909/DR98959 looks to be set up as a Weedkiller-Unit.Destination for today is Bristol-Barton Hill.Tomorrow night it will carry on down to Exeter.Seen here passing through a very green stretch of line at Ram-Hill nr Westerleigh Junction. 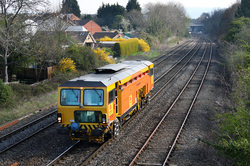 4-wheel Track-Machine DR73931 wearing the now familier colours of the 'Colas' Company heads south through Cheltenham. No other info on this infrastructure-plant move available? A pair of Tampers DR77903 and DR71111 head north past Lympsham south of Weston-super-Mare.Destination unknown. 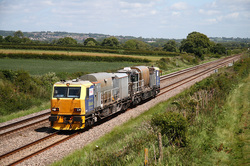 ..03 june 2010..
Multi-Purpose-Vehicle or MPV-DR98960/DR98910 seen nr Lydney with '6Z10' from Bescot going to Cardiff.At this time of year probably set up as a WeedKiller-Unit. ..24 may 2010.. 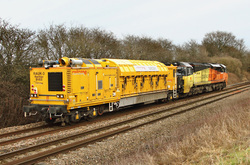 Possibly unique liveried DR-73942,a 'Plasser and Theurer Switch & Crossing Tamper' working for Colas passes Magor in South-Wales heading West. ..24 april 2010..